The Irish are fantastic storytellers, and Olivia Kiernan proves that she is going to be one of the best. Too Close to Breathe is the first in the Frankie Sheehan mystery/thriller series and debut novel for her. Detective Chief Superintendent Frankie Sheehan who four months earlier, was almost killed in an attack trying to apprehend a killer. When she is called to a Dublin suburb to investigate the supposed suicide of a woman, Eleanor Costello, who is found hanging from a rope in her home. At first, it seems cut and dried and the case can be closed but after the autopsy report shows old wounds and broken bones Frankie realizes that this is not a suicide. Of course, the first suspect is the husband. Another woman's body is discovered with the same MO as Eleanor's. Then Paul Costello is found and that really throws the investigation into a tailspin. Frankie is challenged with all she has to try to figure out what really happened. Frankie is a strong but flawed, a bit rough around the edges, woman who tries to take charge of her demons and keep an open mind in her investigation. With the help of her team, Frankie pulls out all the stops in this case. 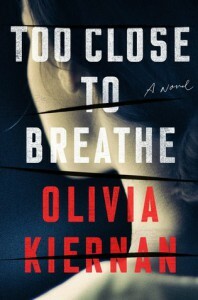 Too Close to Breathe is a taut thriller that will have fans of Tanya French and Gillian Flynn excited to read this new author. I really loved the story and definitely want to read more from Olivia Kiernan.